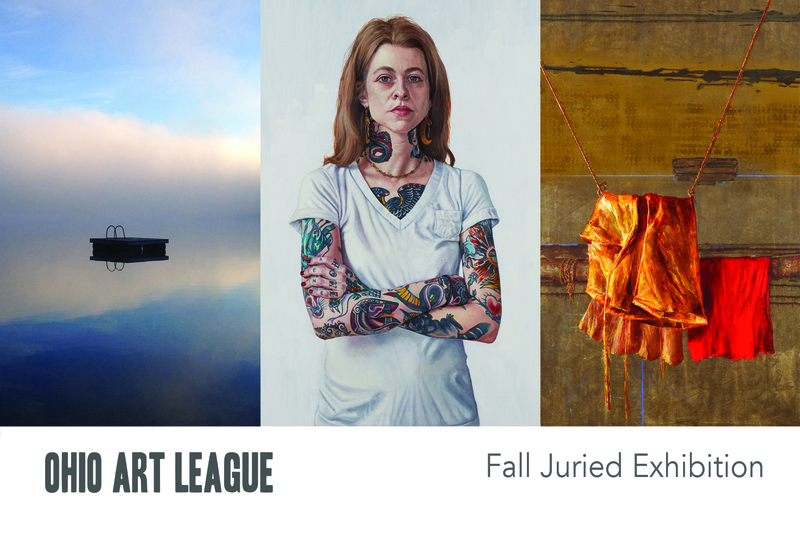 OAL’s Annual Fall Juried Exhibition opening reception is tomorrow night at Ft. Hayes Shot Tower Gallery! Hope you will join us and see the incredible work by artists across this great state! Since 1910, Ohio Art League’s annual juried exhibitions have been the backbone of the organization’s artistic programming, showcasing contemporary work by Ohio artists. For each exhibition, a juror is invited to recognize work of high artistic merit. This year’s fall juror of esteem is Mary Gray, Gallery Director of Ohio Arts Council’s Riffe Gallery. The exhibition runs September 8 – October 15, 2015 at the Fort Hayes Shot Tower (546 Jack Gibbs Blvd, Columbus, OH 43215). Hours are: Monday and Tuesday 8:00 am – 4:00 pm, Wednesday 8:00 am – 6:00 pm, Thursday and Friday 8:00 am – 4:00 pm. Admission is free. The public is invited to attend the Opening Reception at no charge on Friday, September 11 from 6:00 pm – 8:00 pm and an Artist Panel on Thursday, September 24 from 1:00 pm – 2:00 pm. Amy Adams, Patrick Affourtit, Christine Avery, Thomas Baillieul, Ginny Baughman, Tom Bell-Games, Shelley Baird, Shelley Bird, Michelle Boerio, Jennifer Brown, Rex Brown, Louise Captein, Alice Carpenter, Julian Cennamo, Deborah Davis-Livaich, Steven Elbert, Donna Estep, Chloe Fritz, Mark Fohl, Paul Graham, Adrianne George, Kristin Gibson, Linda Gredy, Sheilah Grogan, Christine Guillot Ryan, Jennifer Hall, Tom Hubbard, Andy Hudson, Vanda Hughes, Laurie Ihlenfield, Morris Jackson, Laura Joseph, Marty Kalb, Sophie Knee, Suzan Kraus, Qicheng Kuang, Victoria Lavorini, Kim Maurer, Ronald Mlicki, Barbara Morrison/Mckinley, Ardine Nelson, Paula Nees, Chaz O’Neil, Frank Oriti, Taurey Overturf, Christopher Pack, Dawn Petrill, Caroline Rowntree, Elizabeth Runyon, David Sallot, Lucy Schoyer, Adrian Sibley, Aaron Smith, Duncan Snyder, David Stichweh, Robert Studzinski, Mary Pat Turner, Paul D. Wilbur and Evie Zimmer. Ohio Arts Council’s Riffe Gallery Director Mary Gray has been employed by the OAC since 1993. During her 22 year tenure, Gray has collaborated with scores of Ohio, regional and international artists, curators and art institutions in the presentation or production of over 135 exhibitions of varying themes and media. Gray has juried numerous shows for museums, galleries and organizations across the state and in the region, lectured on gallery operations for various student groups and arts organizations, and moderated and facilitated for OAC and community panel meetings and workshops. Gray served on the OAC’s International Committee and has extensive experience coordinating international exhibition projects. Gray graduated from the University of Michigan in 1983 with a bachelor’s degree in Theatre and Drama. Prior to joining ranks with the Ohio Arts Council, Gray held sales positions with Players Theatre Columbus and the Travelers Insurance Company. She currently serves as chair of the Committee for Art Acquisitions for the Commission on the Thomas J. Moyer Judicial Center, Supreme Court of Ohio, she is a member of The Ohio State University’s Town and Gown Advisory Committee and on the steering committee of the Central Ohio Visual Arts Consortium. Ms. Gray served on the board of the Jefferson Center’s Academy for Leadership and Governance, the National Advisory Board of the University of Findlay’s Mazza Collection and is past Vice-president of the Ohio Women in Government. The Ohio Art League is proud to once again partner with Mary Gray and the Ohio Arts Council’s Riffe Gallery. The two organizations have had three past alliances. In 2013, the Ohio Arts Council’s Riffe Gallery hosted the Ohio Art League Curated Exhibition curated by Dennis Harrington, director of the Weston Art Gallery in Cincinnati, Ohio. In 2009, Here and Beyond: Ohio Art League’s 100th Anniversary Exhibition was housed in the Ohio Arts Council’s Riffe Gallery. Here and Beyond was curated by Margo A. Crutchfield, Senior Curator, Museum of Contemporary Art, Cleveland. Lastly, in 2005, The Ohio Arts Council’s Riffe Gallery presented an exhibition showcasing the art of Ohio Art League members. Made In Ohio / Diverse Sources curated by Annegreth Nill, former chief curator at the Museum of Art Fort Lauderdale, Florida, and former curator of 20th century and contemporary art at the Columbus Museum of Art. The Shot Tower Gallery was founded in 1982 as part of the Ft. Hayes Visual Arts Building at the Ft. Hayes Metropolitan Education Campus. It is one of the longest running galleries in Central Ohio with a large and beautiful space that is a venue for large exhibitions that feature local and nationally significant artists. Exhibitions are featured that celebrate cultural diversity, promote community connections and provide interdisciplinary connections and educational resources in the visual arts. The architecture is a focus, as is located in the historically significant Shot Tower building built in 1964 by the United States Army designed as an arsenal. It served as the Columbus Barracks to instruct recruits, specifically music boys, and for recruitment and training through WWI, II and the Vietnam War. 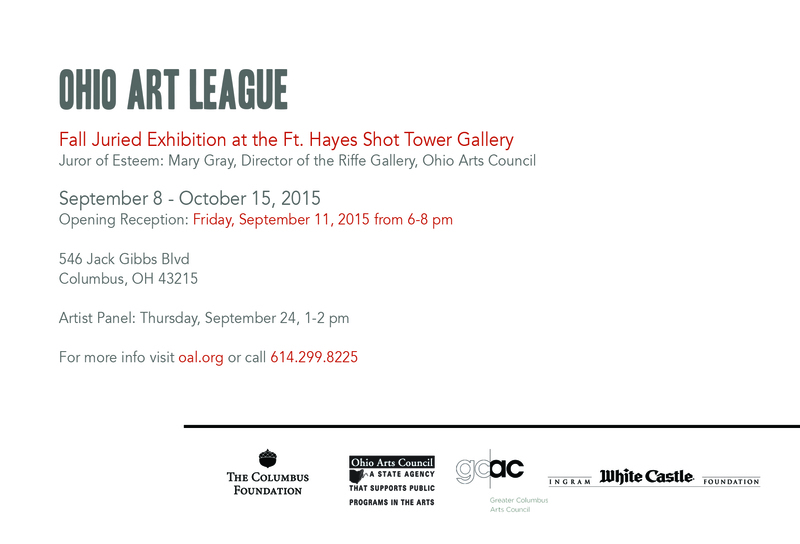 Fort Hayes Shot Tower Gallery is no stranger to working with the Ohio Art League. The two organizations have been partners for over 25 years. Shot Tower Gallery director Teresa Weidenbusch was Vice President of OAL’s Board of directors and in charge of exhibitions from 1981 – 1987. She first brought OAL to the Shot Tower Gallery in 1986. Ohio Art League is a non-profit, member-based organization for visual artists. Founded in 1909, OAL is the longest continually operating non-profit art league in the state. The organization works strategically to help Ohio cultivate and retain top visual art talent while positioning the state as a hub for the visual arts. Through OAL, member artists receive support across all stages of their careers. OAL helps make connections with patrons of the arts and the broader Ohio arts community, provides opportunities for exhibition and studio space and offers exhibition awards, workshops, professional development and members-only events. To learn more about Ohio Art League, to volunteer, sponsor, support or become a member, please visit OAL.org.